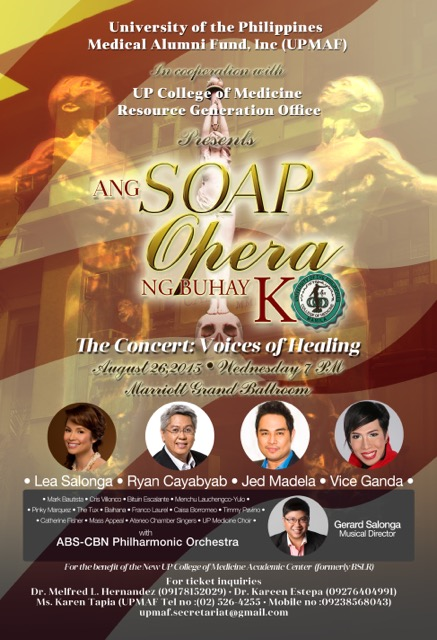 The University of the Philippines Medical Alumni Fund, Inc. (UPMAF) will hold a concert called “Ang SOAP Opera ng Buhay Ko” (The Concert: Voices of Healing) at the new Marriott Grand Ballroom on August 26, 2015 to riase funds towards the creation of the New UP College of Medicine Academic Center, a 7-story multi-million peso undertaking. The dinner concert will feature several of the biggest names in the international and local concert scene, including the 50-piece ABS-CBN Philharmonic Orchestra under the baton of Maestro Gerard Salonga, this special night will bring together Lea Salonga, Ryan Cayabyab, Jed Madela, Vice Ganda, Mark Bautista, Cris Villonco, Menchu Lauchengco-Yulo, Bituin Escalante, Pinky Marquez, Franco Laurel, The Tux, Caisa Borromeo, Baihana, Catherine Fisher, among others, as they join the community in a collective voice of healing. A 70-strong chorus composed of The Mass Appeal, Ateneo Chamber Singers and UP Medicine Choir will also fill the grandiose ballroom. This will be Lea Salonga’s last concert before she flies to New York to star in a show called “Allegiance,” which previews in Broadway on October 20! For ticket and sponsorship inquiries please contact, Dr. Melfred L. Hernandez (0917) 815-2029), Overall Chair, Dr. Karin Estepa (0922) 825-3146, Chair, Business Committee, or Ms Kareen Tapia (0923) 8568043 of UPMAF (02) 5264255, upmaf.secretariat@gmail.com.